We have a well-stacked library with more than 20,000 volumes of books and a good number of journals and periodicals are subscribed for the benefit of the students and staff. The Reference Section has a variety of standard encyclopedias, dictionaries and standard reference books on almost all topics at the school level. Well-qualified librarians and assistants, are always available to render any help to the users of the library. The library is computerized and equipped with a Photocopier for taking copies of any relevant article from the reference section of the library. A leased line internet connection is operational in the school library and students are allowed to use this facility on any day. 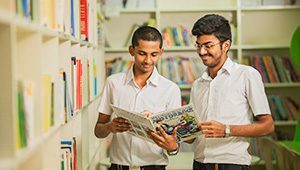 The library is enriched every year and replenished with new volumes of books, magazines, journals, periodicals and latest reference materials to keep in pace with the rest of the world. 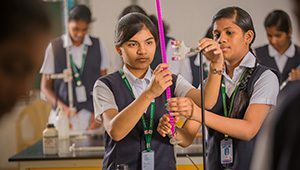 Our state-of-the-art laboratories are well equipped with scientific and modern equipment and facilities for Physics, Chemistry, Biology and Computer Sciene. Our labortories are designed in such a way to inculcate inquisitiveness among the students to do research and innovate. The contemporary computer centre is the cynosure of Paavai Vidhyashram. We have full-fledged computer lab with ample number of computers and other allied facilities. Our dedicated and trained professionals guide the students through practical applications of computer science with the help of learning tools. As a unique identity, we have high speed internet connection service for 24 hrs for students and their parents too. Paavai Vidhyashram Internet Club provides facilities to the students to browse internet from 9.00 a.m. to 9.00 p.m. All the students are members of the internet club and are encouraged to browse of their own interests apart from academics.